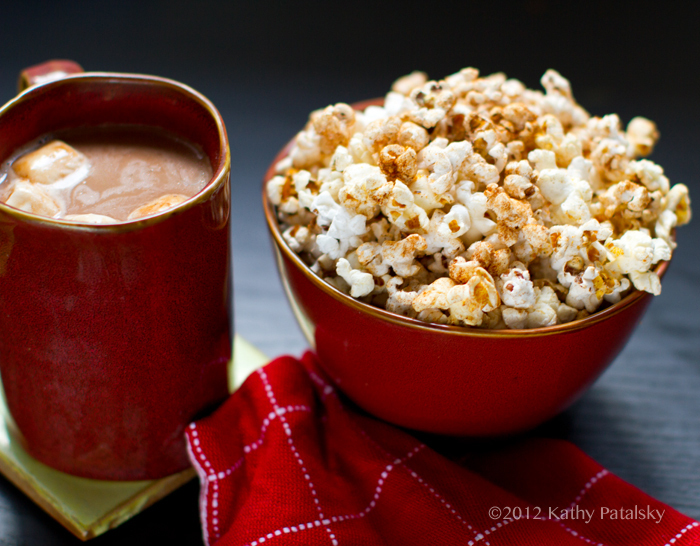 Pumpkin Spice Popcorn & more holiday movie-watching recipes! Hot Cocoa. Bowl of Popcorn. Cozy Blanket. One or two favorite holiday movies. Someone to snuggle with (people or pets!) These are my ingredients for a wonderful holiday season evening or afternoon!.. Movie-Watching Snacks Hot Cocoa. Popcorn. Kale Chips. A festive smoothie. A platter of holiday cookies. These vegan recipes will make your holiday movie watching experience a thing of bliss. 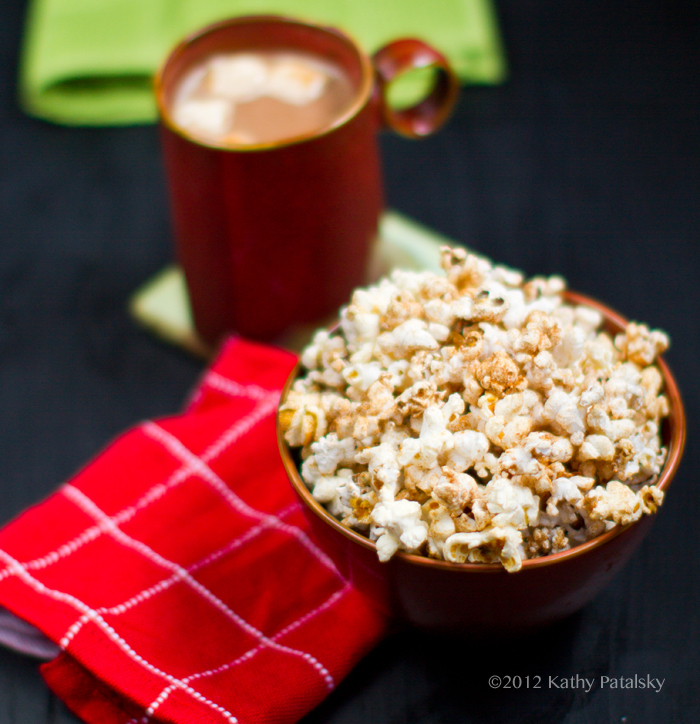 So snuggle on the couch, grab a big bowl of this super cozy Pumpkin Spice Popcorn (recipe ahead!) and a warm mug of vegan cocoa. Sit by a few twinkly lights strung across a window, a glowing candle or maybe a sparkly Christmas tree. This is indeed the coziest time of year so embrace it with these recipes! 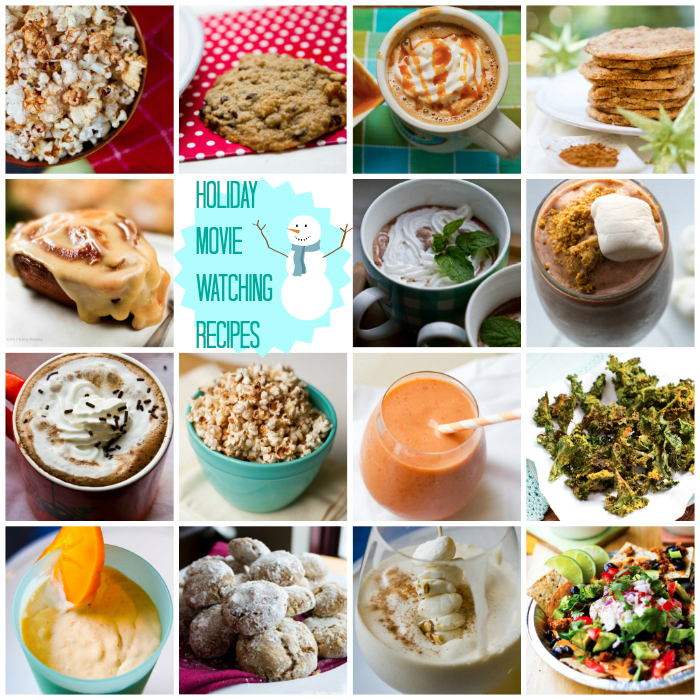 Get a few of my movie-watching recipes + my holiday movie list too..
Every movie needs a movie snack!.. Movie-watching snacks .. recipe links below..
caption, left to right: pumpkin spice popcorn, vanilla choc chip cookies, pb cup latte, snickerdoodle nog cookies, cocoa cinna buns, minty cocoa, cocoa shake, hot cocoa info, cinna-chili popcorn, citrus detox smoothie, kale chips, persimmon shake, walnutcracker cookies, soy nog shake, nachos. * Vegan Nachos make great movie-watching fare! * Try a healthy-delicious bowl of Cheezy Kale Chips instead of popcorn! * Sip on a holiday shake: soy nog or persimmon flavors! * ..or a festive plate of Real Vanilla Bean Chocolate Chip Cookies + chilled non-dairy milk! * Or any of these five vegan holiday smoothies - including "hot" cocoa flavored! * Or try a holiday recipe from my 12 Days of Vegan Treats series - including walnutcracker cookies! 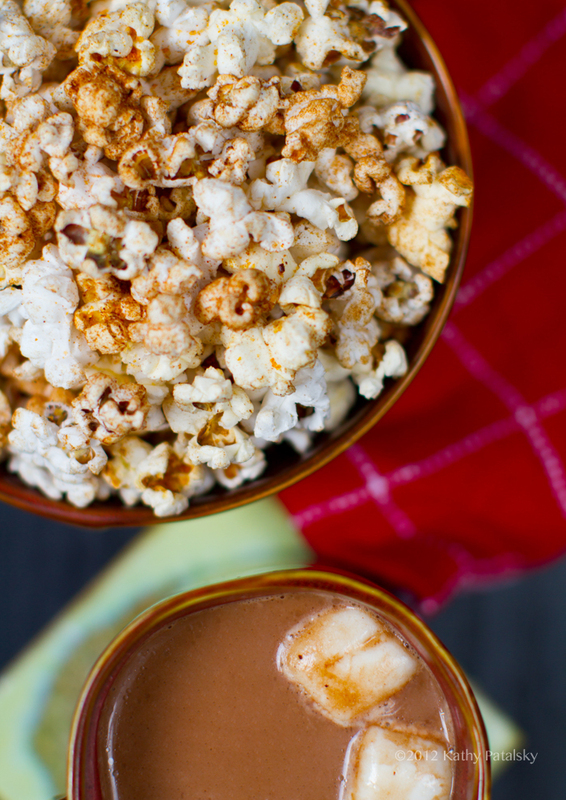 * Warm any movie-watching session up with a foamy Peanut Butter Cup Caramel Hot Latte or Cocoa. *..learn more about vegan hot cocoa here. * Or just make a batch of hot cocoa + marshmallow cinnamon rolls! 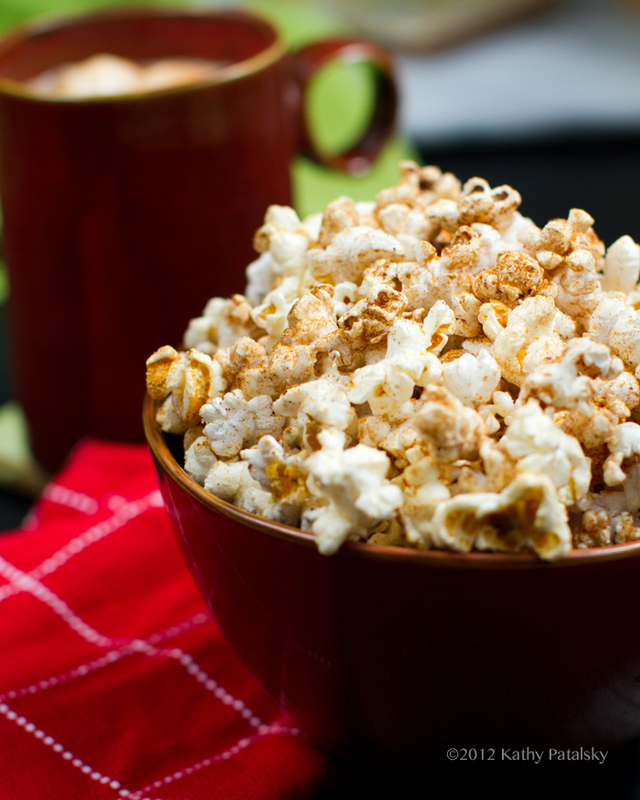 * Popcorn lovers' - also try my Cinnamon Chili Coconut Oil Popcorn Recipe! Or try my easy Pumpkin Spice Popcorn..
*any vegetable oil will work, but I highly advise that you try coconut oil! It is delicious! Directions: Using an extra large stock pot or popcorn popping pot, add 3 Tbsp coconut oil over med-high heat. Drop in 2-3 kernels and cover pot with lid. Wait until first kernel pops, then add in the 1/2 cup popping corn. Quickly cover with lid and beware any stray popping kernels! Shake around pan for next minute as kernels pop. Turn heat higher if needed to help along the popping – just be sure to move those kernels around so the don’t burn. After most of the corn has popped – turn off heat. Do not open lid as kernels should still be popping a bit. Let sit until popping stops, then transfer to a large mixing bowl. While popcorn is still hot, toss with spices, salt and optional additions. Serve warm! Directions: Heat milk + briskly stir in the cocoa powder and sweetener + top with vegan Dandies marshmallows. Serve steamy hot! Soy whipped cream optional. Holiday Movies. Everyone has their own personal favorites that they can watch again and again - year after year and never get sick of. What is yours?? Mine: White Christmas. I used to dance around in my living room with my sister in a sparkly silver ballet outfit pretending I was one of the "Hanes sisters." I wanted to be Judy, but my family always said I was more a Betty. Hm. How could a little girl not LOVE those frosty ice blue dresses with matching dance fans? Here are a few of my fave holiday movies..